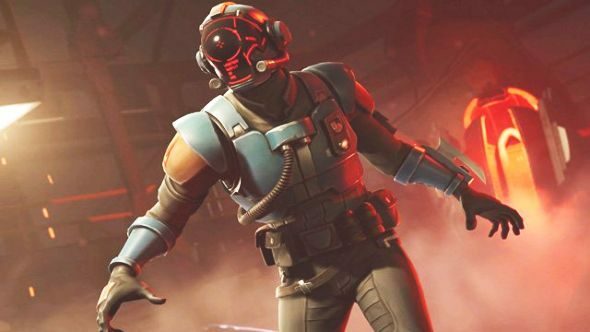 At the beginning of Fortnite season four, players were puzzled by the arrival of two new types of challenges among their Battle Pass rewards – the Blockbuster and Carbide challenges. Carbide was a free skin that could be upgraded by levelling up, but the reward for completing the Blockbuster challenges could only be unlocked after players had completed seven full weeks of battle pass challenges. That meant, of course, that we wouldn’t get to see that reward until at least seven weeks had passed – you can’t complete seven sets of challenges if only six have been released. Fortnite might be the biggest out there, but which is the best battle royale? Now that seven weeks have passed – the Fortnite week 7 challenges went live yesterday – the new skin has appeared. It’s called The Visitor, and it’s a legendary skin with some light customisation. Most of that comes from a faceplate that allows you to swap between four digital displays, including a charming smiley-face. There’s also some back bling in the form of a cape, which you can remove or replace if you so wish. If you haven’t completed all seven of the sets of challenges you need to earn The Visitor, then don’t worry – you’ve got until Fortnite season four comes to an end in July to tick them all off.